-- looking for 11th edition? 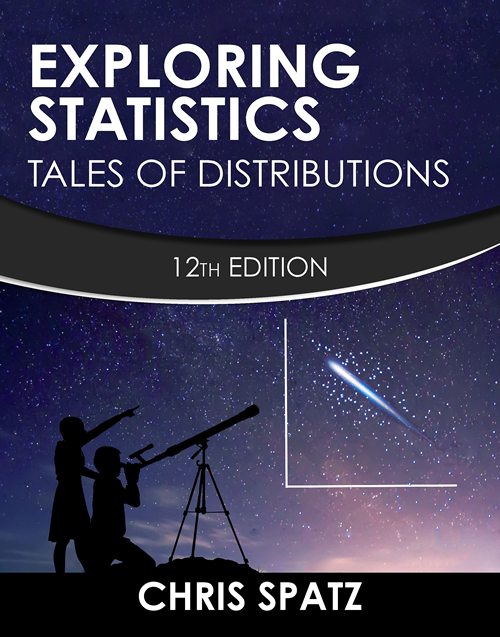 Exploring Statistics: Tales of Distributions (12th ed.) is a textbook with a voice – the voice of an encouraging professor who wants students to succeed. "My students and I absolutely loved the book! The great narratives and examples reduce a lot of math anxiety the students have." "In addition to being one of the most lucid and student-friendly texts out there, I appreciate your commitment to making the book affordable." "I love your textbook - it's so easy to read and accessible for students." Exploring Statistics: Tales of Distributions (12th edition) directly acknowledges that the practice of statistics is in a state of transition. Null hypothesis significance testing (NHST), the main-stay technique of the 20th century, is under attack. Exploring Statistics: Tales of Distributions (12th edition) addresses this transition and emphasizes effect size indexes and confidence intervals. At the same time, the text maintains the clear explanations of NHST and the engaging writing style that made previous editions so successful. Appendix A is designed to help alleviate anxiety and provide encouragement. Additional practice problems in arithmetic, algebra, and complex operations are in Free Materials on this site. Appendix A, Arithmetic and Algebra Review completely revised and retitled, Getting Started. Practice problems in arithmetic, algebra, and complex operations added to Appendix A.
Online interactive student Study Guide made available. Test Bank - The Test Bank for Exploring Statistics: Tales of Distributions (12th edition) is a 2500-item Word document written by the author. It can be requested by adopters. Study Guide - An online interactive Study Guide accompanies Exploring Statistics: Tales of Distributions (12th edition). Students can purchase 6 months of access to the Online Study Guidefor only $12. Student test-planning exercise - A web-based exercise is available under Free Materials. Students can use this free exercise to identify resources that are available for an upcoming test.